Random House Trade Paperbacks, 9780812971835, 336pp. What freedoms do the residents of Crosby, Maine, experience in contrast with those who ?ee the town for bigger “ponds” (California, New York)? Does anyone feel trapped in Crosby, and if so, who? What outlets for escape are available to them? Why does Henry tolerate Olive as much as he does, catering to her, agreeing with her, staying even-keeled when she rants and raves? Is there anyone that you tolerate despite their sometimes overbearing behavior? If so, why? How does Kevin (in “Incoming Tide”) typify a child craving his father’s approval? Are his behaviors and mannerisms any way like those of Christopher Kitteridge? Do you think Olive reminds Kevin more of his mother or of his father? In “A Little Burst,” why do you think Olive is so keen on having a positive relationship with Suzanne, whom she obviously dislikes? How is this a re?ection of how she treats other people in town? Does it seem ?tting to you that Olive would not respond while others ridiculed her body and her choice of clothing at Christopher and Suzanne’s wedding? How do you think Olive perceives boundaries and possessiveness, especially in regard to relationships? Elizabeth Strout writes, “The appetites of the body were private battles” (“Starving,” page 89). In what ways is this true? Are there “appetites” that could be described as battles waged in public? Which ones, and why? Why does Nina elicit such a strong reaction from Olive in “Starving”? What does Olive notice that moves her to tears in public? Why did witnessing this scene turn Harmon away from Bonnie? In “A Different Road,” Strout writes about Olive and Henry: “No, they would never get over that night because they had said things that altered how they saw each other” (p. 124). What is it that Olive and Henry say to each other while being held hostage in the hospital bathroom that has this effect? Have you experienced a moment like this in one of your close relationships? In “Tulips” and in “Basket of Trips,” Olive visits people in dif?cult circumstances (Henry in the convalescent home, and Marlene Bonney at her husband’s funeral) in hopes that “in the presence of someone else’s sorrow, a tiny crack of light would somehow come through her own dark encasement” (p. 172). In what ways do the tragedies of others shine light on Olive’s trials with Christopher’s departure and Henry’s illness? How do those experiences change Olive’s interactions with others? Is she more compassionate or more indifferent? Is she more approachable or more guarded? Is she more hopeful or more pessimistic? In “Ship in a Bottle,” Julie is jilted by her ?ancé, Bruce, on her wedding day. Julie’s mother, Anita, furious at Bruce’s betrayal, shoots at him soon after. 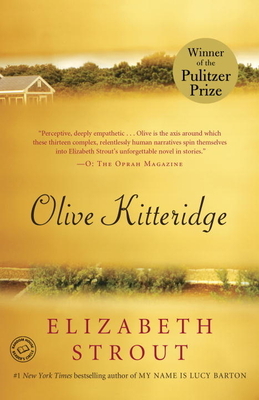 Julie quotes Olive Kitteridge as having told her seventh-grade class, “Don’t be scared of your hunger. If you’re scared of your hunger, you’ll just be one more ninny like everyone else” (p. 195). What do you think Olive means by this phrase? How does Olive’s life re?ect this idea? Who is afraid of his or her hunger in these stories? In “Security,” do you get the impression that Olive likes Ann, Christopher’s new wife? Why does she excuse Ann’s smoking and drinking while pregnant with Christopher’s ?rst child (and Henry’s ?rst grandchild)? Why does she seem so accepting initially, and what makes her less so as the story goes on? Was Christopher justi?ed in his ?ght with Olive in “Security”? Did he kick her out, or did she voluntarily leave? Do you think he and Ann are cruel to Olive? Do you think Olive is really oblivious to how others see her– especially Christopher? Do you think she found Christopher’s accusations in “Security” shocking or just unexpected? What’s happened to Rebecca at the end of “Criminal”? Where do you think she goes, and why do you think she feels compelled to go? Do you think she’s satis?ed with her life with David? What do you think are the reasons she can’t hold down a job? What elements of Olive’s personality are revealed in her relationship with Jack Kennison in “River”? How does their interaction re?ect changes in her perspective on her son? On the way she treated Henry? On the way she sees the world?